When a brilliant emigré scientist is killed by a hit-and-run driver and the body of a female employee of the American Embassy is washed up in the Thames, DCI Frank Merlin and his team investigate. Merlin's investigations soon ruffle feathers at the Foreign Office as the American ambassador, Joseph Kennedy, is a well-known supporter of appeasement, and many powerful and influential Britons favour the pursuit of a negotiated peace settlement with Hitler. 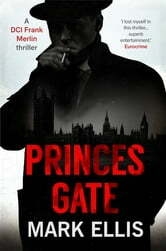 The death of another embassy employee leads Merlin into some of the seedier quarters of wartime London. His investigations are hampered by interfering superiors fearful of their impact on Anglo-American relations. This at a time when, to many, America represents Britain's only hope of salvation. Capturing the atmosphere of Britain in January 1940 Princes Gate is an enthralling detective novel. I dreaded the last page--that's how good this is. A typical British police procedural, but with the added background of the looming WWII to add spice and drama. I thoroughly enjoyed the story. It revolves around the start of WW II and shows us the seedier side of pre-Blitz London and it's police force. One thing I don't like is the way two, or three characters are talking, and there is no separation in their dialogue. It might take two or three reads of the piece to realise who was speaking. Very bad of whosoever was the proof reader. You need a new one! I can do it for you. But, yes, a very good read.